← Grintegrity: Learn it. Know it. See it. It is almost cliché for my generation to joke that Social Security will be gone before we retire. It may be a stretch, but it really is no joking matter. Social Security is in a bad way, and it is getting worse. The number of Social Security recipients is growing faster than the number of people paying into it. It is a likely scenario that the Social Security trust fund (which doesn’t really exist, anyway) will be gone by the time I stop paying in and start asking for it back. What started out as a “modest design” to supplement the income of the poor in the last few years of life has become the staple and entitlement of all retirees. With advances in health care, retirees are living longer. From an average life expectancy of about 61 in 1935, we’re now expected to live to 78 today. In other words, the retirement age is stuck at 1935 levels (65), but instead of only a few of us living to collect Social Security, we’re all living far past what the system’s designers expected. Coupled with rising costs of living, but a failure to increase the amount paid into the fund, Social Security, if not reformed, will run out before I start collecting. That’s the short version of the problem. It must be addressed, no matter how controversial it might seem. In fact, because of the controversy around Social Security reform, any solution should be non-partisan, inclusive, and transparent. As a friend of mine likes to say, reality is not negotiable and no matter how controversial, failure to reform Social Security will result in a serious problems down the road. Further, it’s not impossible. Australia, New Zealand, Canada, the UK, and Chile have all recently begun implementing steps to make their programs sustainable. If it can be done there, it can be done here. Focus on those in need: trim back benefits upper and middle-income people who don’t need it, while retaining high enough levels for individuals who have paid in to the system for thirty years. Trim cost-of-living adjustments, maybe .05%, especially for those in upper income brackets. Gradually increase the normal and early retirement ages in step with increases in average life expectancy. This could have a major impact, especially during a two decade implementation period. Encourage people to work longer by allowing them to defer benefits until later for greater payout. Require supplemental savings accounts, savings that are real, not some imaginary trust fund of I.O.Us. the federal government manages. Federal elected officials and employees already have this, and it would give pre-retirement death benefits and supplemental post-retirement benefits. How ready is Washington to start working on this problem? Not very. In 2009, with the economy in the pits, President Obama asked Congress to make an ad hoc payment of $250 to each Social Security beneficiary. Why? Because the official cost-of-living adjustment formula didn’t justify an increase in benefits. At $13 billion, it was a very expensive bit of “blatant political pandering.” Conveniently, it was paid for with debt, debt that no current Social Security beneficiaries will ever have to pay back. No, that’s something they’ve left for my generation, if any of us have the guts to take it on. 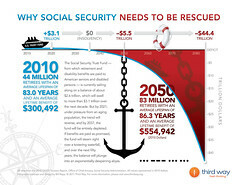 This entry was posted in Entitlement Reform and tagged Comeback America, Cost of Living Allowance, David M. Walker, entitlement reform, fiscal responsibility, ideas, Life expectancy, politics, postaday2011, President Obama, reality is not negotiable, Retirement, Social Security, Social Security debate (United States), United States. Bookmark the permalink.